Grade Lvl: T Author: Cotugno, Albert J. Book considers the theoretical and practical implications of developing and implementing peer-based, group-focused therapeutic approaches with children on the autism spectrum. The author, a clinical and educational psychologist, describes the theoretical underpinnings of an intervention model based on cognitive developmental principles, and explains why a group approach is best suited to address and remediate an ASD child's social deficiencies. Shows how to implement skill-based instructional approaches and presents strategies to assess the short- and long-term effectiveness of this type of therapy, both within the group and in external settings. 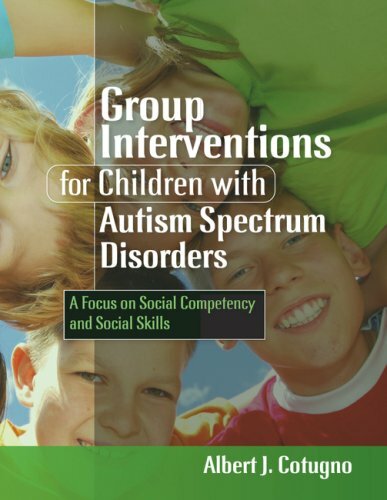 The book is intended for school, clinic, and general practitioners involved in group work with special needs children, professionals working with ASD children, and anyone interested in using group interventions as a means to treat social competency and social skills deficits.